With the deadline looming for our Fall/Winter 2014 photo shoot, we are all sneaking in knitting whenever we can. To keep up my physical and creative energy – and to keep from going crazy – I’ve been consuming copious amounts of coffee, tea, chocolate and good music. I can’t remember how exactly, but sometime during my design process for this upcoming season, I stumbled upon the music of Joni Mitchell. I was hooked from the first song. Of course, I recognized a few but I had never given her music the attention it deserved. Her music is timeless and feels just as relevant today as it was when she first performed. Both her beautiful songs and fabulous sense of style, helped inspire a collection of garments and accessories that I am so excited to see come together. I think River might be my favorite song right now. It’s so sad, but I can’t help but be captured by its lyrics. It’s funny how music can stir up such strong emotions and inspire. Joni Mitchell, a wonderful performer. Blue is probably one of the most perfect albums ever! The Court and Spark album is a close second favorite though. And enjoy the Heijra album as well! Have loved Joni since I first heard ‘Both Sides Now’ back in the late 60’s (eep!). There’s a good documentary about her on netflix streaming. 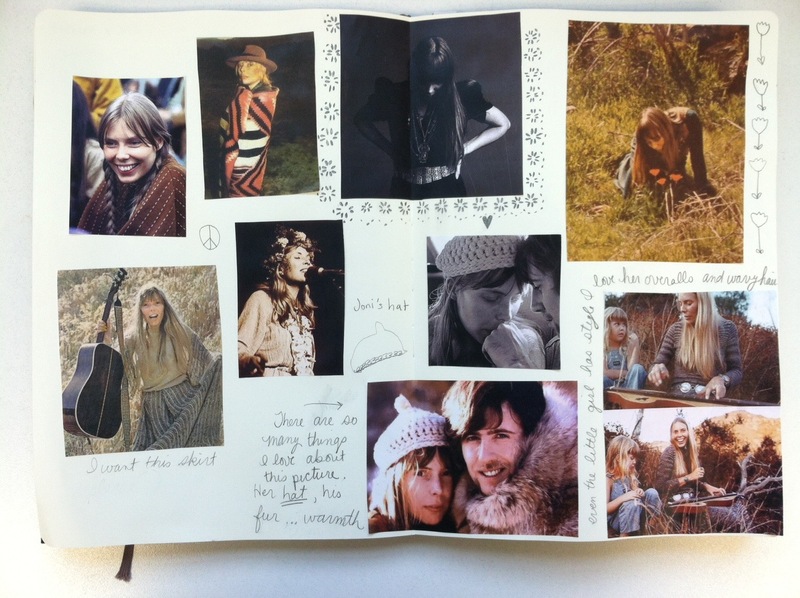 Great collage of pics you’ve put together — especially like the ones of her with Graham Nash. They should have stayed together – such a perfect (seeming) couple.